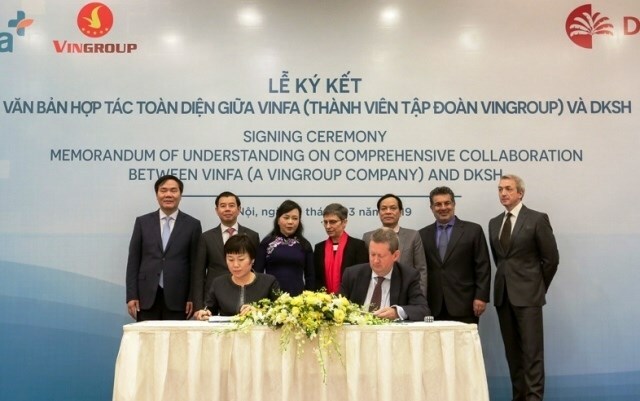 Hanoi (VNA) – Conglomerate Vingroup’s pharmaceutical company VinFa on March 21 signed a memorandum of understanding on strategic cooperation with Switzerland-based DKSH, a market expansion services provider. The two companies will cooperate in importing pharmaceutical products and producing modern medicines in Vietnam. They will also look to the export of Vietnamese traditional medicine. DKSH will transfer technology to VinFa and help it train human resources in line with standards set by the Vietnamese Ministry of Health and the international community. Following the success of the Vinmec Medical System, Vingroup has established VinFa Joint Stock Company and equipped it with advanced technologies. VinFa focuses on the production of good-quality Vietnamese and Western medicines, health food, vaccines and medical equipment of international standards. In addition to exploiting the country’s precious herbal resources, VinFa plans to promote cooperation with prestigious pharmaceutical producers in the US, Europe and Australia. The aim is to receive consultancy, technology and technical expertise as well as facilitate the import of raw materials and products.